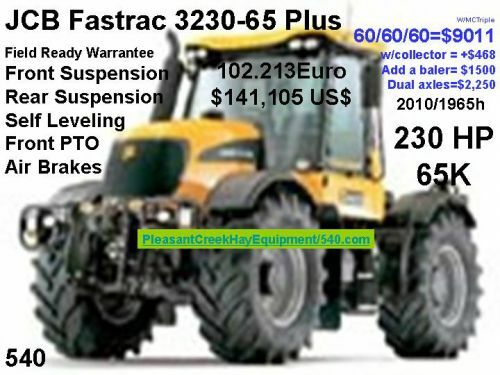 If you are a perspective partner please read PleasantCreekHay.com Main Page regarding MOWING and baling hay and Main Page II regarding chopping forage. 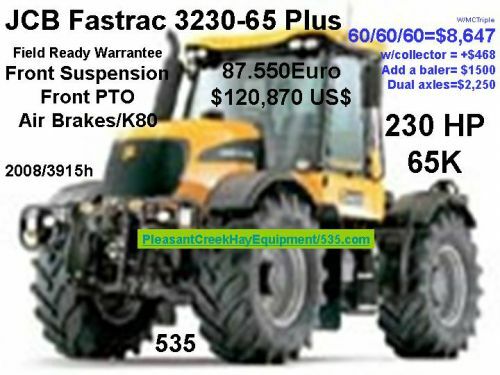 At any given time we have approximately 150 tractors, 150 Mowers, 50 Ploughs and 50 Balers that are listed as for sale globally. 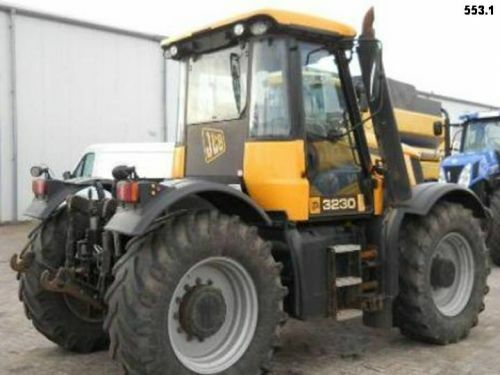 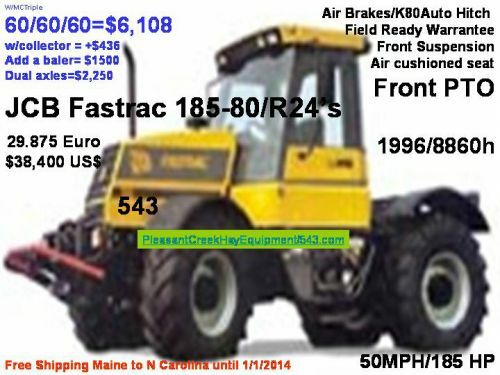 Few of the dealers are ever contacted as to there tractor and/or being available and willingness to ship their equipment to the nearest major port for delivery to Boston, New York, Baltimore or Suffolk, VA. We recommend you choose 3 tractors from which to contact. Contacting all,, we are going to take a first response approach unless a dealership suddenly balks at shipping the tractor to the nearest port! 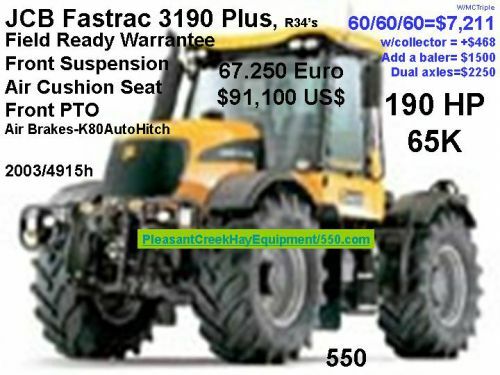 And others: Being custom operators, PleasantCreekHay.com has to get slightly more for what will be back up tractors if the tractor is returned. 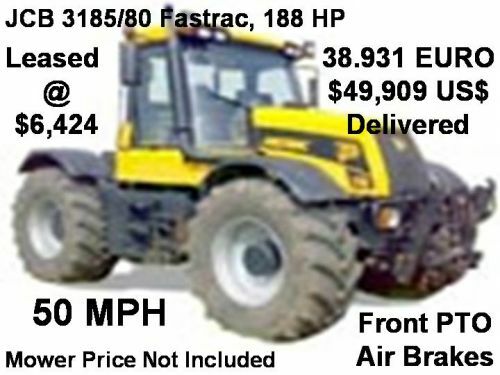 All of our listed tractors have front PTO and Air Brake systems. 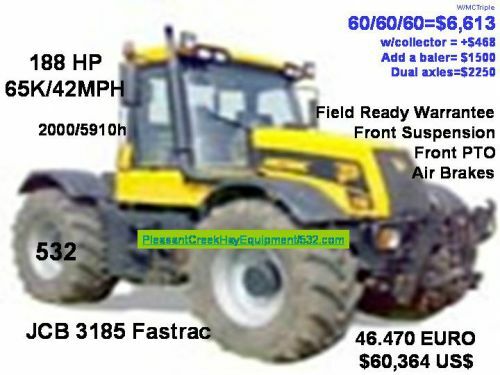 PLeasantCreekHay.com is only interested in a minimum 50K/Hr! 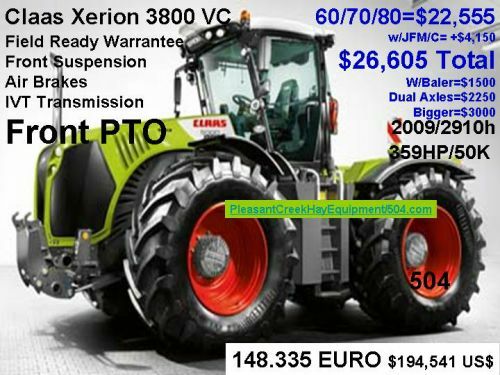 The 40K's may have CVT Transmissions! Great Farm Tractors! 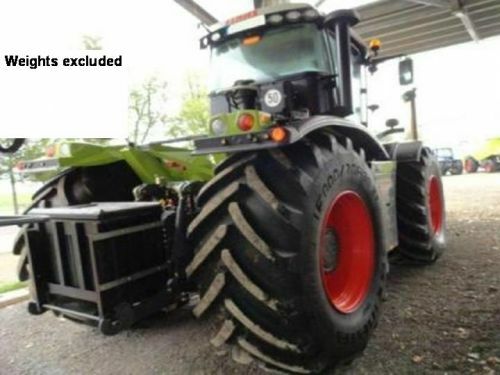 For custom operations? 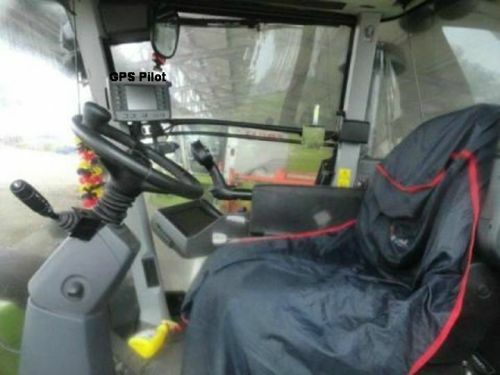 Slooooow! 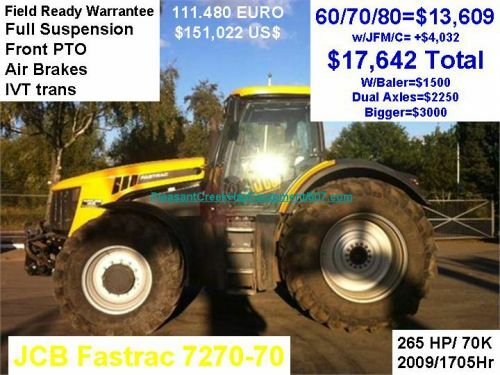 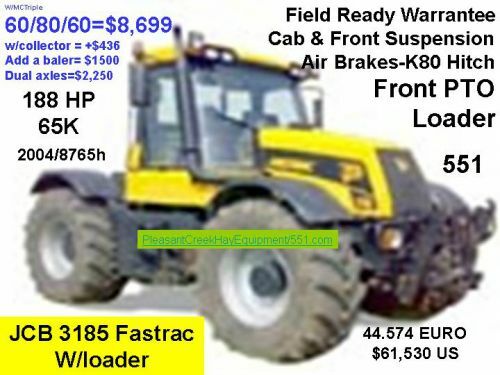 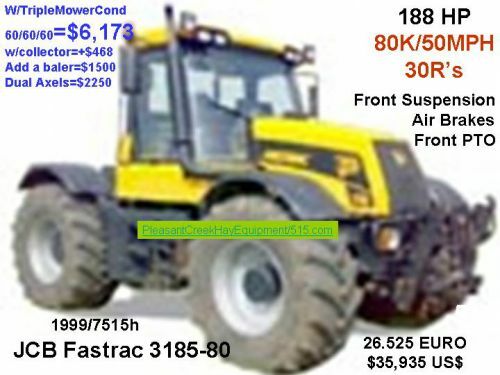 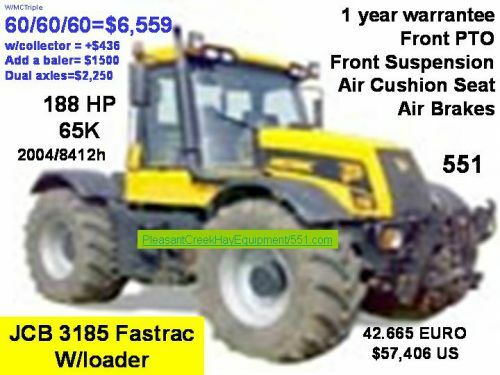 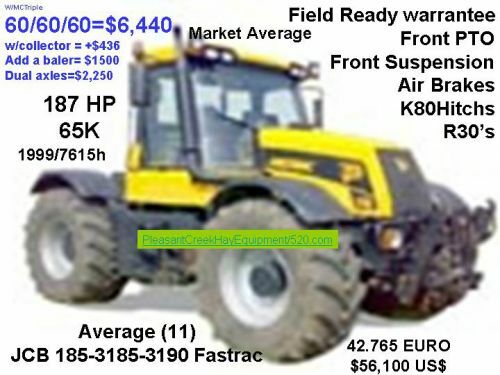 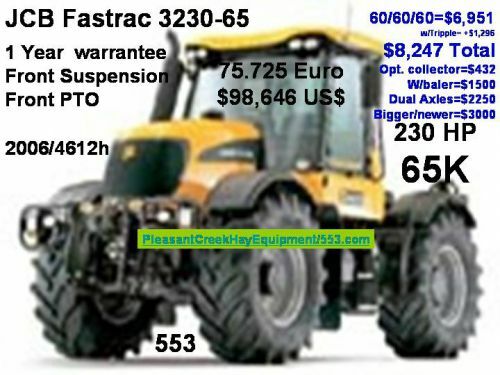 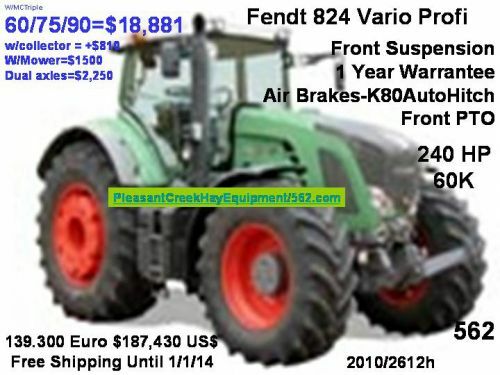 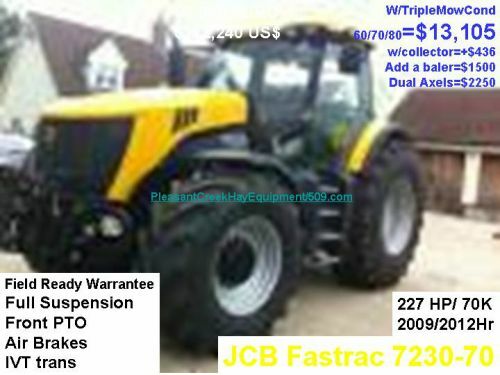 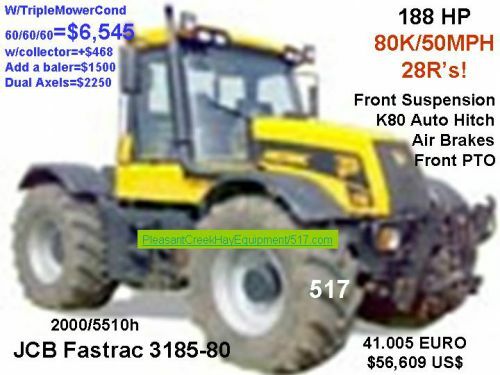 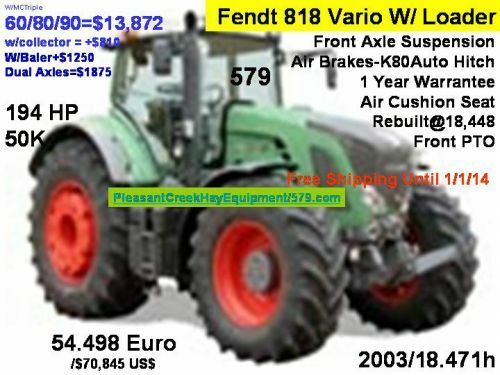 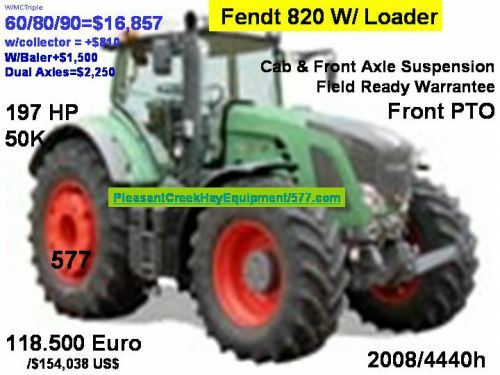 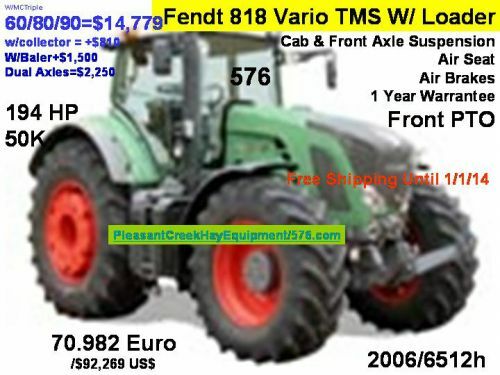 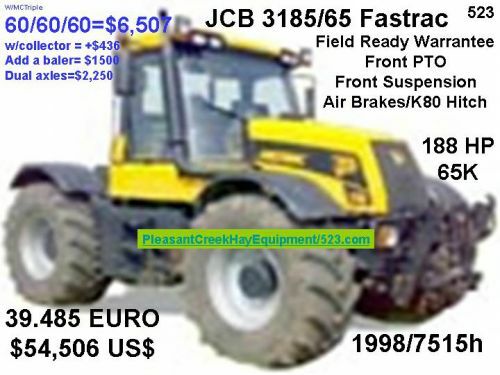 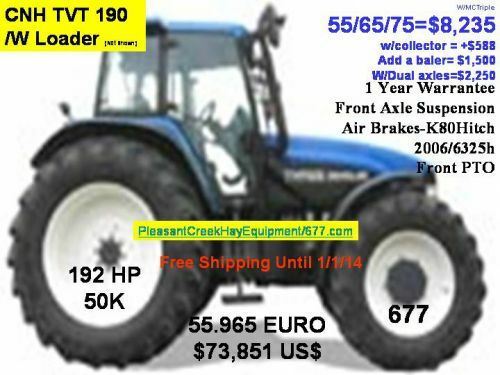 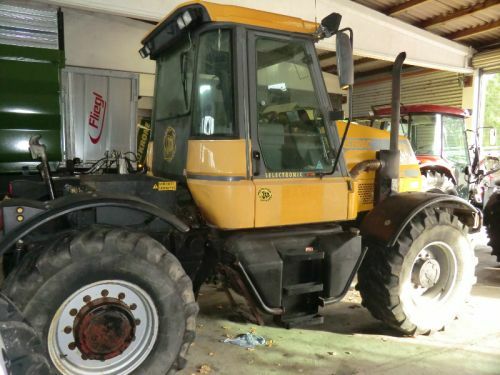 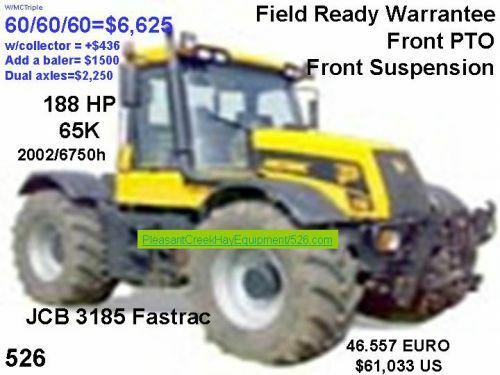 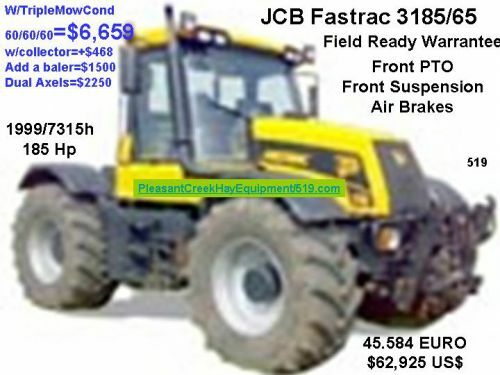 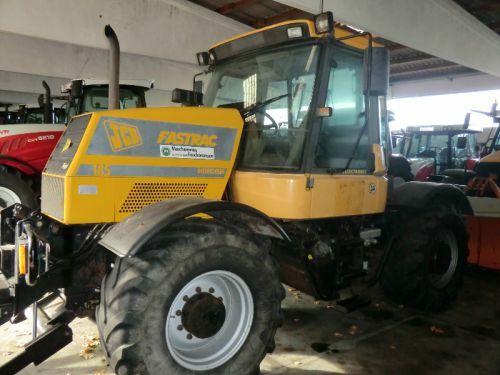 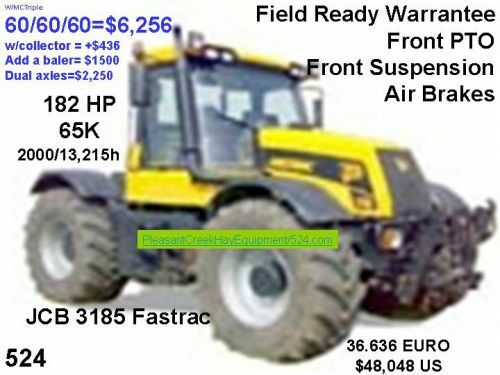 If you are interested in the outright purchase of a front PTO tractor with less power or >65K, PleasantCreekHayEquipment.com will be happy to do a search of available tractors from our European suppliers. 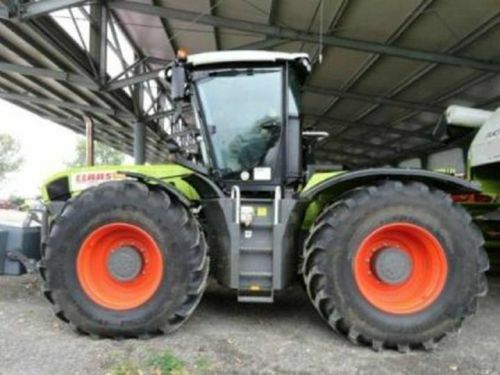 Too much power! 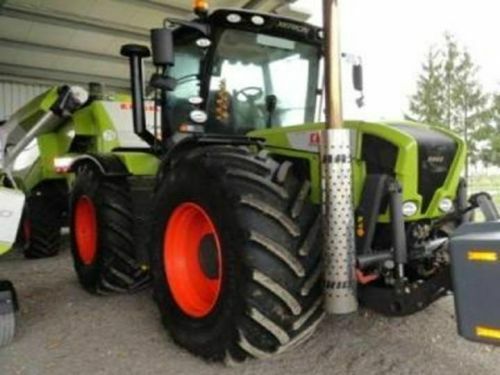 Maybe not for your operation, but as custom operators, we would rather put a second tractor into the field rather than load up the horses with a tractor that may or not be able to utilize the additional power in our mowing operations. We have to get more pennies/thousand $'s to cover the over investment if we have the tractor turned in without a purchase! 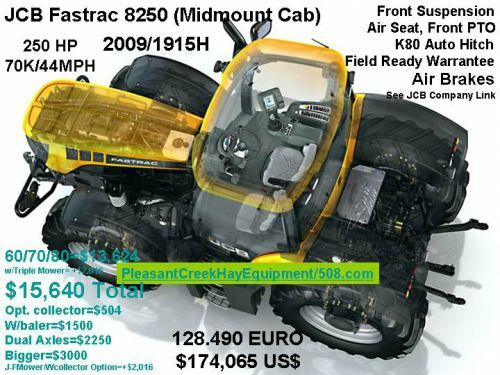 At times, availability is limited in some tractor lines and in "mower collectors", but when available we are limiting our leasing to units able to utilize collectors and are requiring the leasing of mowers with collectors when we can find them in the tractors location or here in the US!. 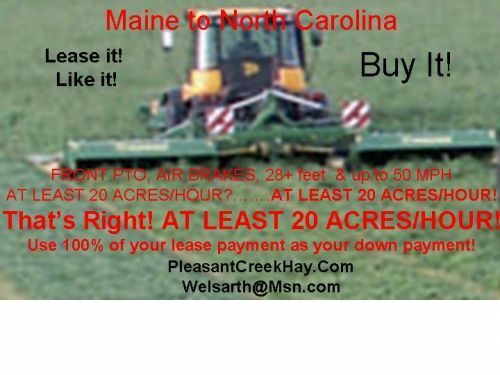 If the lease is returned, we want the unit up and running to mow Pleasant Creek Hay's hay the next day! 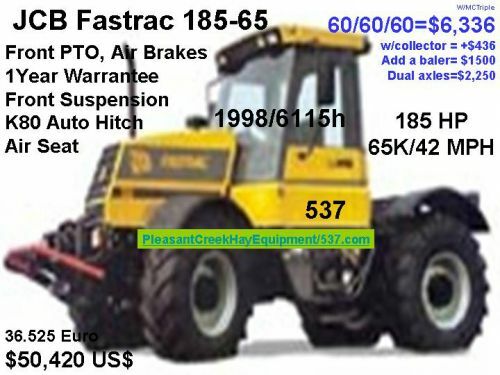 We don't want you leasing the tractor on a whim! 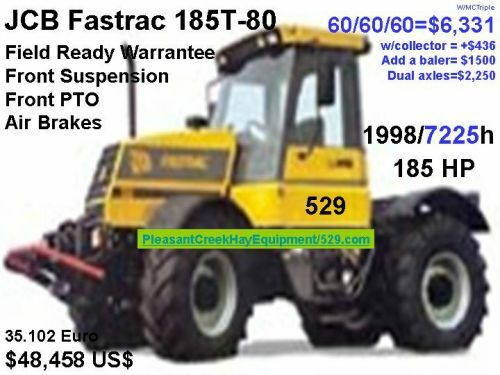 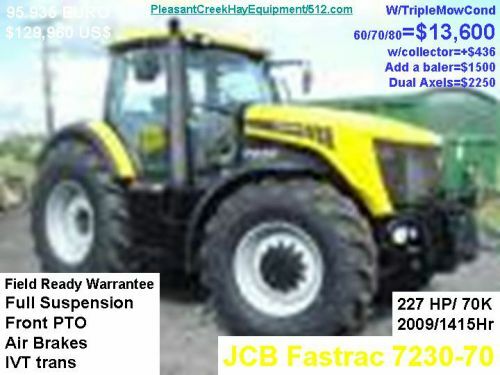 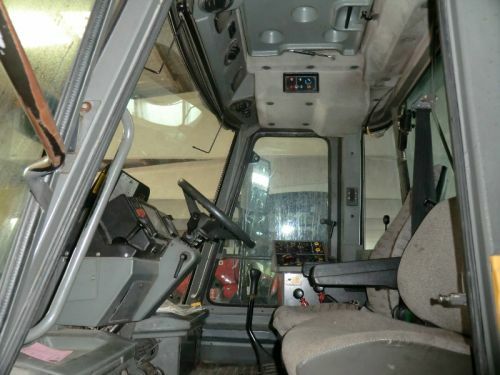 If the tractor is mechanically correct, we expect a purchase and feel we have a lease price adequate to cover PleasantCreekHayEquipment.com's costs if returned! We're leasing the "Big brother", the JCB 8250 of cab forward design, 60-65-70. 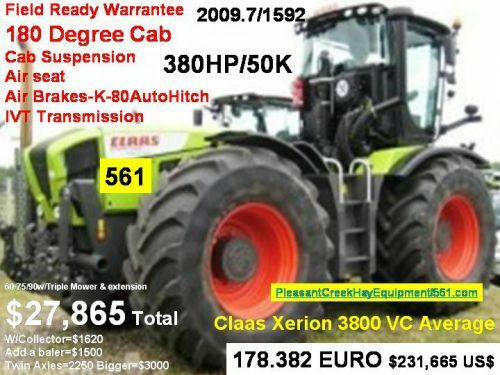 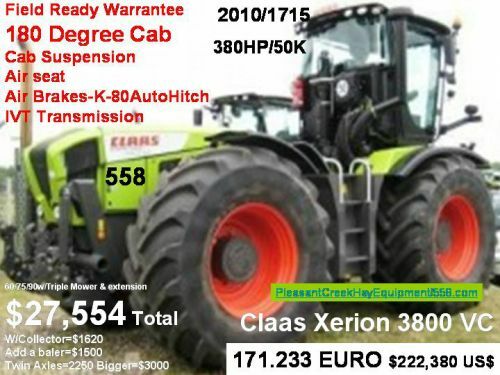 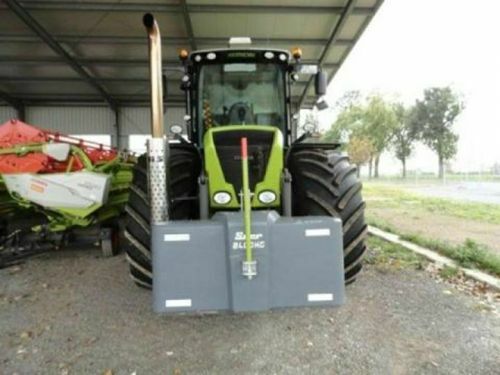 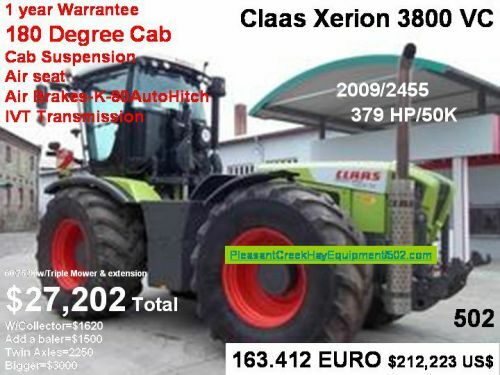 Claas Xerion 3300 VC's and 3800 VC's WITH FRONT PTO (50K), 60-75-90. 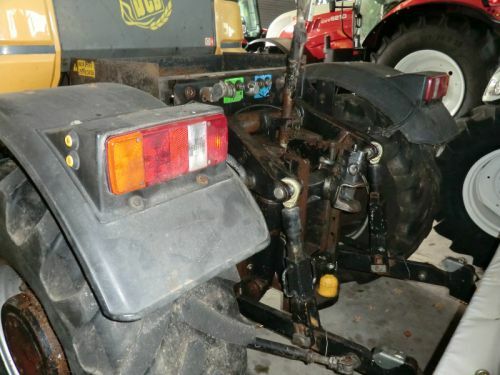 We're requiring the leasing (and purchase with the tractor) of a triple mower including collectors if they are available. 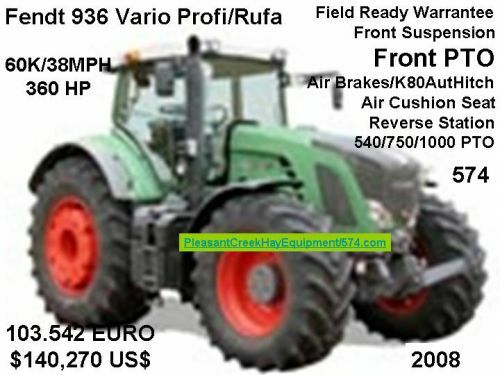 A super mower 11.6 meters wide with its collectors is required for tractors of 255 HP or more. Over time we hope our partners have a fleet of front PTO tractors, parked and ready to roll! 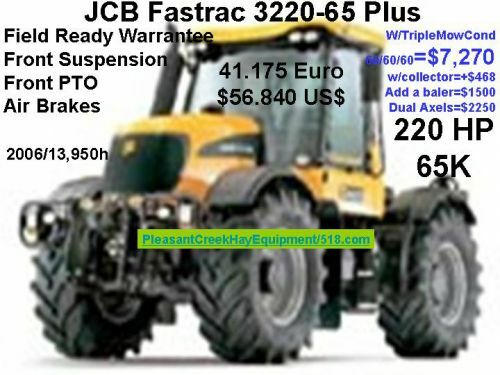 (We'd like for example, our partners to have a mixer wagon of adequate size to utilize the power of one of our mower tractors and loader of adequate size to mow hay by day and feed cows by night and or in the mid AM! The timely feeding of our partner's cows and mowing of our partner's fields is always our first priority! 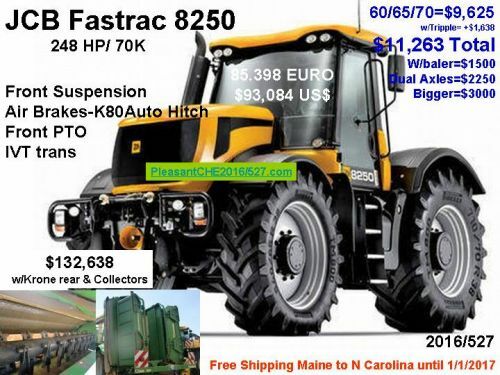 although a 65 K machine may be adequate to get from field to storage, from farm to farm and from the last bus stop to the farm the 80 K machine has the advantage: therefore for our partners we are recommending the purchase of 80 K machines as a first choice of purchases. 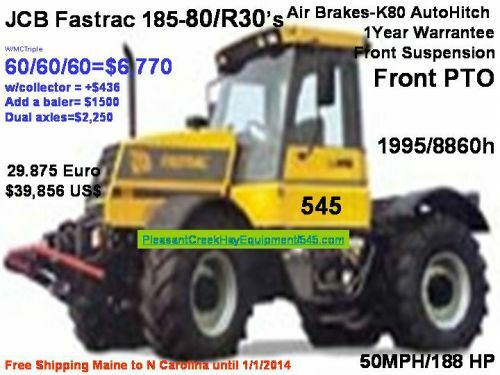 At 42 MPH, What is stock? 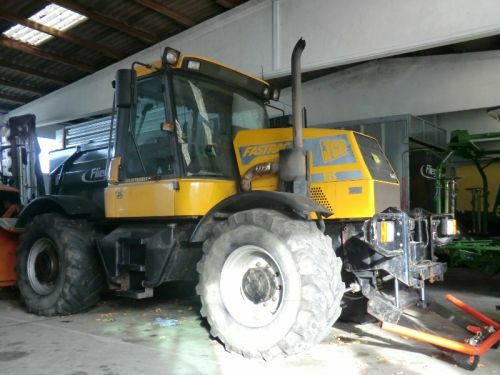 Deere? 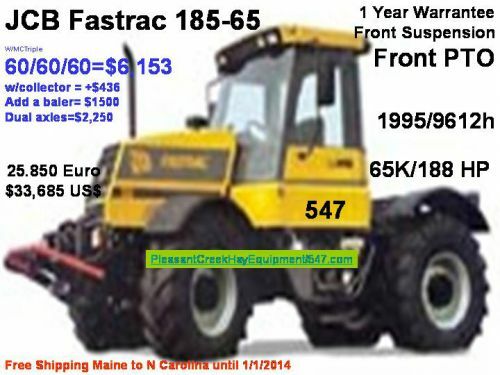 NH-Case IH? 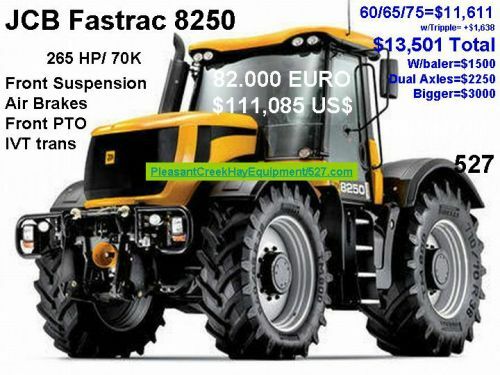 We think the 3200's deserve a category unto themselve. 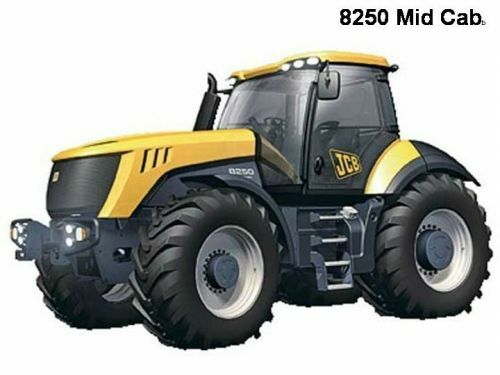 Four wheel Suspension, Self Leveling, Self Shifting, Suprior in so many ways to every other tractor on the market, including that of the JCB 185, 3185 and 3190 forerunners! 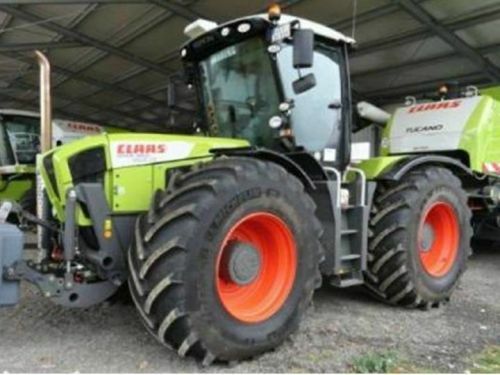 But not within the update period! We are grouping our JCB 3190, 3185 and 185 Series tractors together. 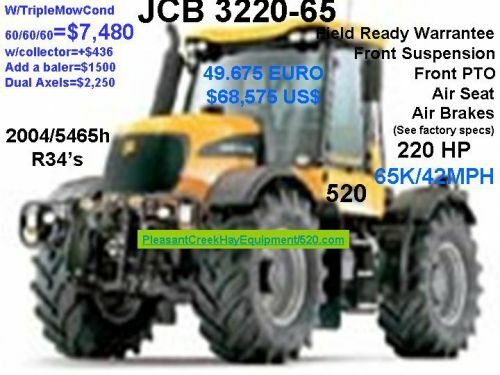 It is our feeling the multiple series have enough in common that the hour meter vs series places more differences in value then the decal on the side of the tractor! 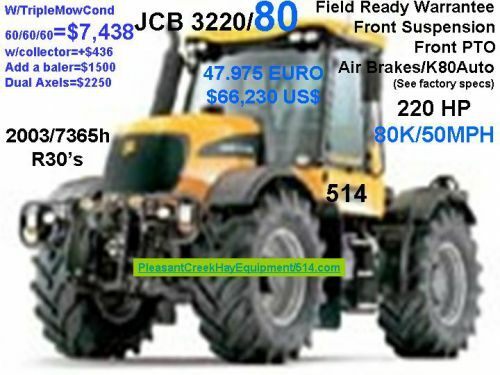 JCB 185-3185-3190/65K's OUR MEDIAN 42 MPH! 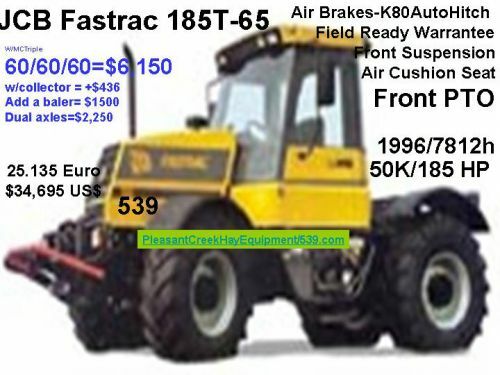 OUR Not so average 185-3185-3190's 80K's 50 MPH! 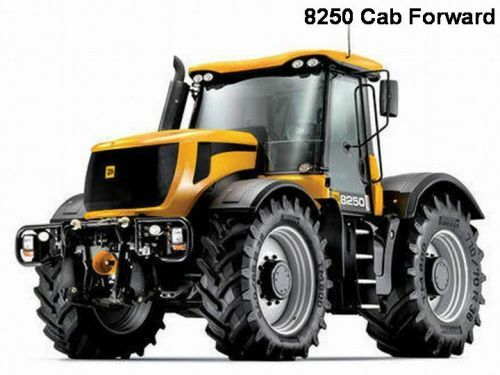 Our Favorite, Cab Forward Design! 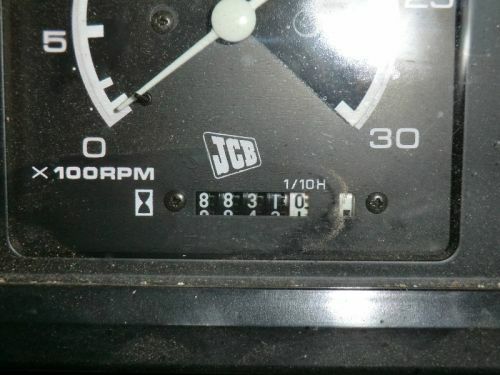 44 MPH! 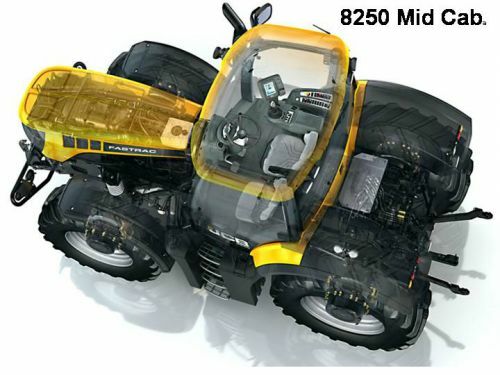 There are 8250's and 8250's, we prefer those made earlier of Cab forward design and LIKE the newer FULL suspension of the 7000 series. 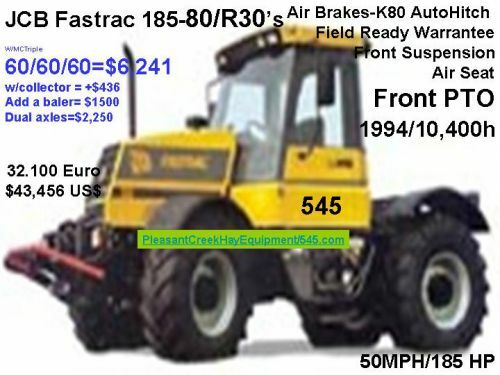 Contact US: We no longer maintain a web site inventory, but are willing to do a search for presentation! 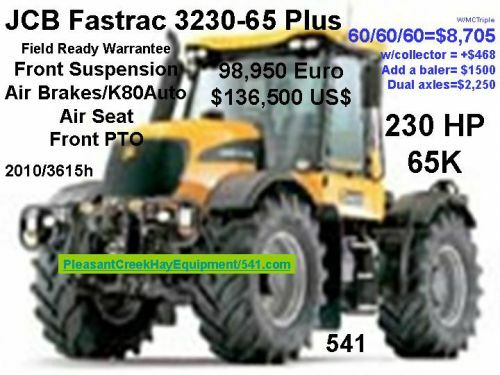 Loader tractors, any color at 50K, 31 MPH or more! 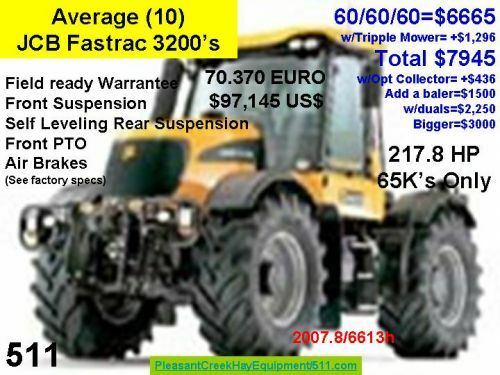 We no longer maintain this category as well and advise buyers to purchase a loader to match a 180 HP Plus JCB Fastrac! 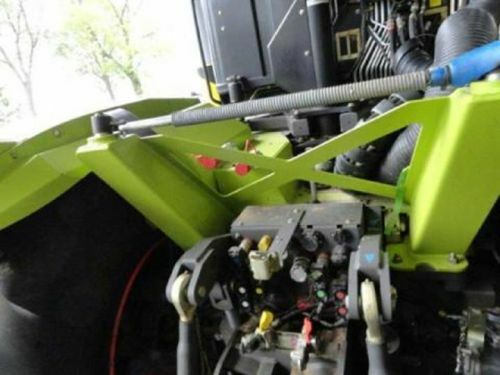 We envision using the loader, even within our partnerships to cut hay, then be available to pack the pile! Dropping the front mower and reattaching a loader (leaving the rear mower attached as balast) you can be pushing and packing the pile within minutes with a 180+ HP tractor. 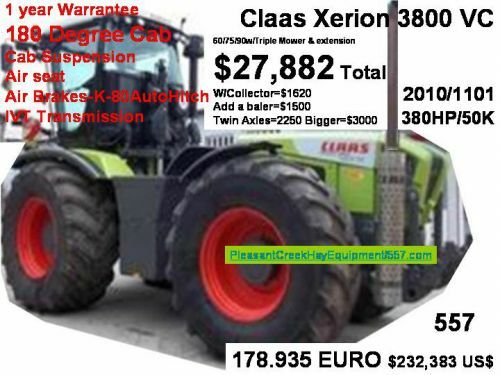 4) 50K Class Xerion Tractors 31 MPH! 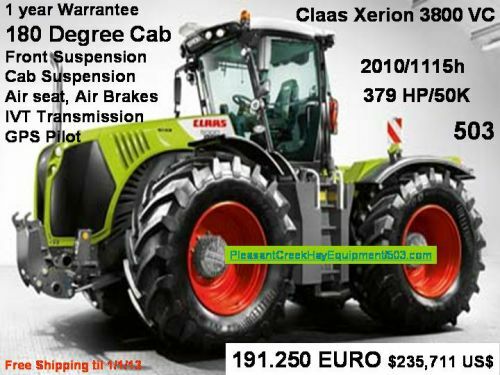 4b) 50K Class Xerion Tractors VC's (Reverse Station) 31 MPH! 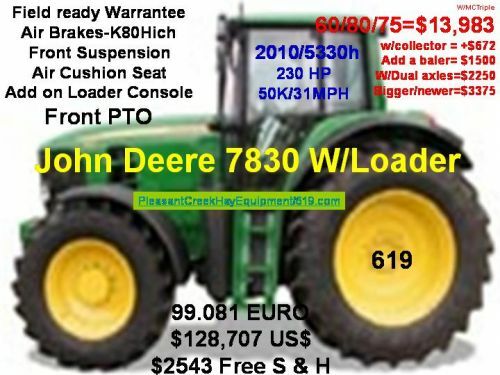 Contact us: We no longer maintain a current inventory!